The United States took over the lead in gold medals at the 2016 Rio Olympics with big performances on Day 4. Breaking a tie in first-place finishes with China, the U.S. extended its lead in overall medals, as well. As of publication time Wednesday morning, Team USA leads the way with 27 total medals, holding a 10-medal lead over China. The U.S. has 10 gold medals to China’s eight entering Day 5, thanks to the best Olympian of all time. 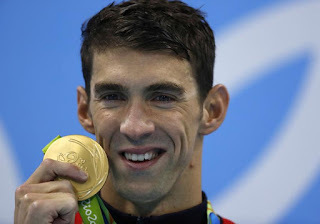 Michael Phelps is up to 21 career gold medals, winning gold in the 200-meter butterfly and anchoring Team USA’s first-place finish in the men’s 4x200-meter freestyle. The swimmer now has more than twice as many gold medals as anyone that’s ever competed in the Summer Olympics. Carl Lewis, Mark Spitz, Larisa Latynina and Paavo Nurmi all won nine at the Summer Games. While Phelps has been winning gold medals since 2004, Simone Biles is competing at the Games for the first time. But even though she’s new to the Olympics, many have proclaimed her to be the best women’s gymnast in history. Leading Team USA with the top score in the vault, balance beam and floor exercise, she helped the U.S. easily win gold in the team all-around competition. There was never any doubt that USA's “Final Five” would win gold. Defeating second-place Russia by eight points, Biles, Aly Raisman, Gabby Douglas, Madison Kocian and Laurie Hernandez gave Team USA back-to-back gold medals in the event. U.S. swimmer Katie Ledecky also took home the gold, finishing first in the 200-meter freestyle. She already won a gold and silver medal in Rio before that race. China added a gold medal on Tuesday when the diving team won the women’s synchronized 10-meter platform. Chen Roulin and Liu Huixia totaled 354.00 points to finish ahead of Malaysia and Canada. Japan ranks third with 14 total medals, though the nation has only won three golds. The country’s 10 bronze medals ranks first in the Olympics. Nitaanzisha matembezi ya KM 1300 kuchangisha fedha za kujenga ofisi na kambi ya kudumu ya RT.